What started as a hobby turned into a job and became an obsession. 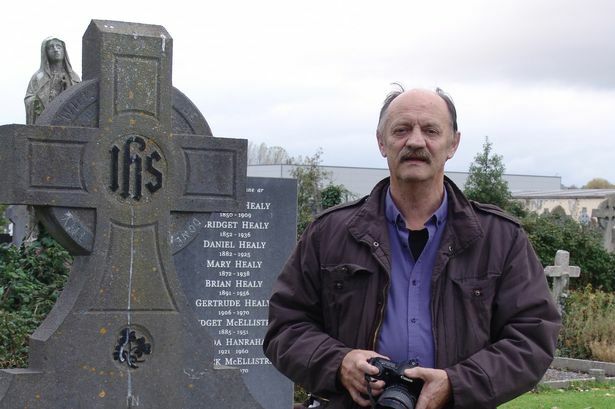 Now Tralee resident Joe Maher has created a website filled with headstone images from more than 200 County Kerry cemeteries, representing more than 130,000 dearly departed since the 1770s. Joe Maher. Image from Irish Mirror. “The idea came to me when I started my family tree in 2008 and hit many dead ends,” Maher, no pun intended, writes in the About page of his website, www.kerryburials.com. He started the job in May 2013 and just finished up last month. Kay Caball of the always excellent My Kerry Ancestors website and blog also wrote a post about Maher. Both sites contain useful links for genealogists and history buffs with an interest in Kerry. Maher’s photo collection includes the Celtic cross and burial marker of my maternal relatives, the Diggin family of Lahardane townland on Knockanore Hill, just outside Ballybunion. Thirteen members of the family are buried at Kilehenney Cemetery on the Sandhill Road, near the entrance of the Ballybunion Golf Club. Now Maher is beginning to photograph and index headstones from County Cork. Support his efforts with a donation if you can. This entry was posted in Arts & Culture, Business & Environment, History, Religion and tagged Cork, Joe Maher, kerry on November 29, 2014 by admin. Hi Mark, I appreciate your post about my site, http://www.kerryburials.com/ on your blog. I hope you found it useful in tracing your relatives in Kerry.